Home » Blog » Microsoldering, Motherboard Repairs » What Can Go Wrong When Repairing an iPad? As we get closer and closer to the limit of Moore’s Law, devices get more and more complex and so do their components. iPads in particular have seen a large shift in internal design and complexity over the last year or so and as such repairing them has become more and more difficult. The iPad Pro 12.9inch for instance has up to three times as many speakers as a traditional iPad, the screen assembly has an entirely separate daughter board that governs several new functions including 3D touch and the functionality of the Apple Pencil. The daughter board is a soldered on flat cable the is vary delicate and easily torn the repair will consist of removing the daughter board from original screen and attached to the new screen using a soldering iron and microscope. What does this mean for the average screen repairer? Like any industry, the more complex a task the more things can go wrong, from replacing the screws in the wrong positions, to damaged back light components and broken chips, all the way to accidentally broken screens or burnt or damaged components from soldering or heat gun accidents. FPC connectors being damaged during removal. Changing the FPC connector which is board level repair that we often have sent in via mail in repairs across Australia we often see other technicians that have attempted to remove them in the incorrect way and caused one or more of the solder pads to be pulled off the board sometime’s they don’t matter as they have no lines that they connect to but other times they will need to be traced with new lines to get connectivity again. This is also a timely repair that could have been prevented if knowledge was applied. Backlight filters are often blown in Ipads when technicians attempt to repair the screens! why do they blow well the first thing that any repairer needs to do is disconnect the battery especially the newer ipads tend to have more voltage running to the fpc connector that connects the lcd and digitizer! attempting to reconnect when there is current still at that FPC connection will no doubt leave you with no backlight on your screen, using micro soldering to fix this repair will be the way to go! we will need to replace those filters and sometimes even the diodes that will cause no backlight, this repair generally can be a quick turnaround depending on workflow send you ipad to A One Mobiles & Repairs as we accept all mail in repairs and board repairs across Australia. Fingerprint sensor flex cable damage. 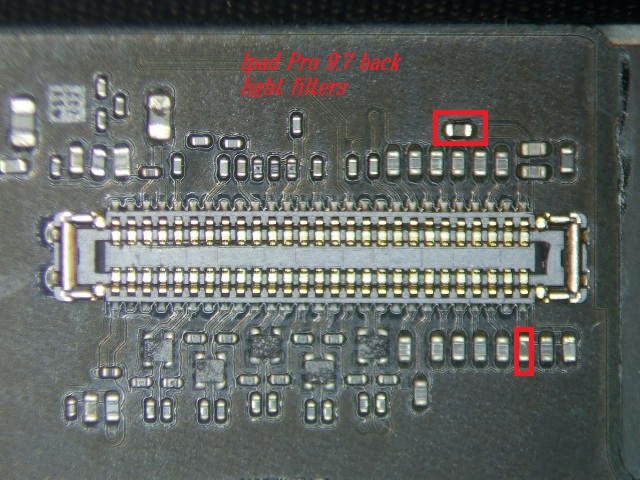 On the newer Pro series and air and mini iPads it is very easy to rip or damage the flex cable that connects the home key and sensor array to the logic board. Connectivity to the fingerprint sensor is married to the motherboard if broken or torn and they are replaced there will be no fingerprint sensor to unlock your ipad! unfortunately not even A One Mobiles & Repairs can fix this problem and will have to be send back to apple care to have them reprogrammed together. The list of things that can go wrong while you are repairing a screen is as varied and myriad as the parts of the iPad itself. A One Mobiles & Repairs accept board repairs and mail in repairs Australia wide.